I've looked around and many people advised running the df -h Command. I have done that and nothing has changed for me. This is usually caused by a stale lock file from a crashed previous session. 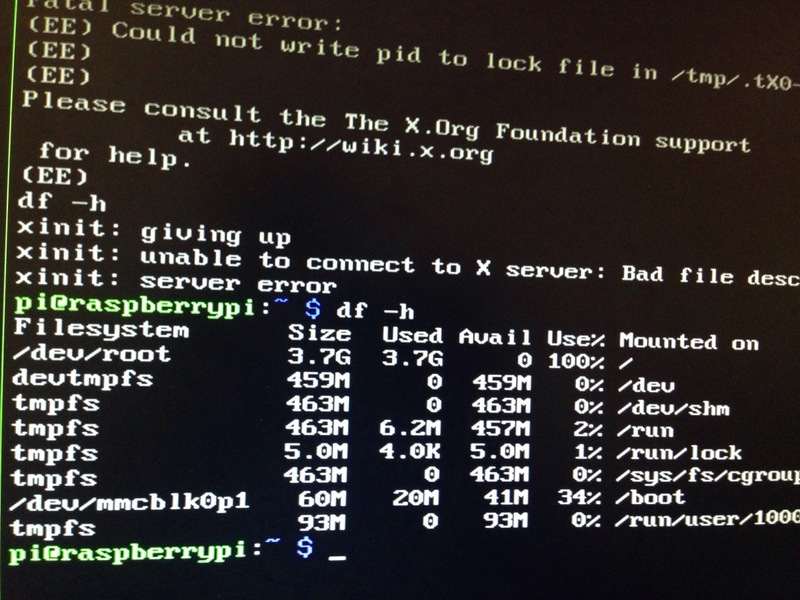 As root, look for an existing /tmp/xtX0-lock and delete it, then try starting X again. Being out of drive space will also do it. Try deleting everything under /var/log, then use sudo apt-get erase <packages...> to perhaps remove some packages you don't actually need. NOTE: Don't delete the directory structure under /var/log...just delete files; otherwise some services that expect certain log directories to exist will fail to start. Realistically, 4GB is much too small a root device on a system which runs X. Image the SD card onto a larger one and expand the fs. I had the same situation after installing opencv from source files. even erasing of files was only hardly possible - sometimes with crazy error msgs. i uninstalled the gimp package. i deleted the source files of opencv. after deleting the whole opencv the strange effects were gone. Not the answer you're looking for? Browse other questions tagged raspbian startx or ask your own question. I could not find the disable_l2cache in my config file then How to disable it?